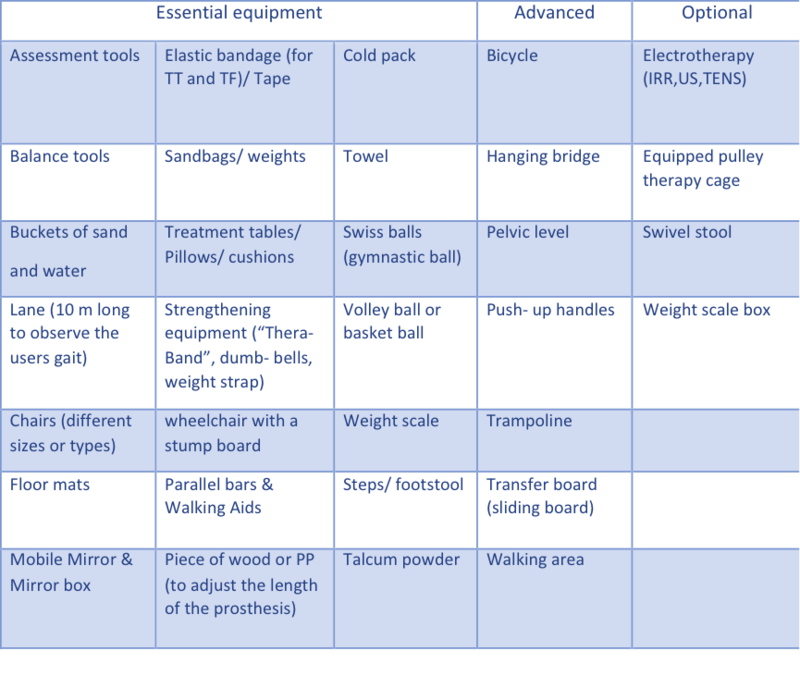 Individuals with amputation are in need of a proper rehabilitation program as early as possible and generally require compensatory equipment to reach maximum functional independence. 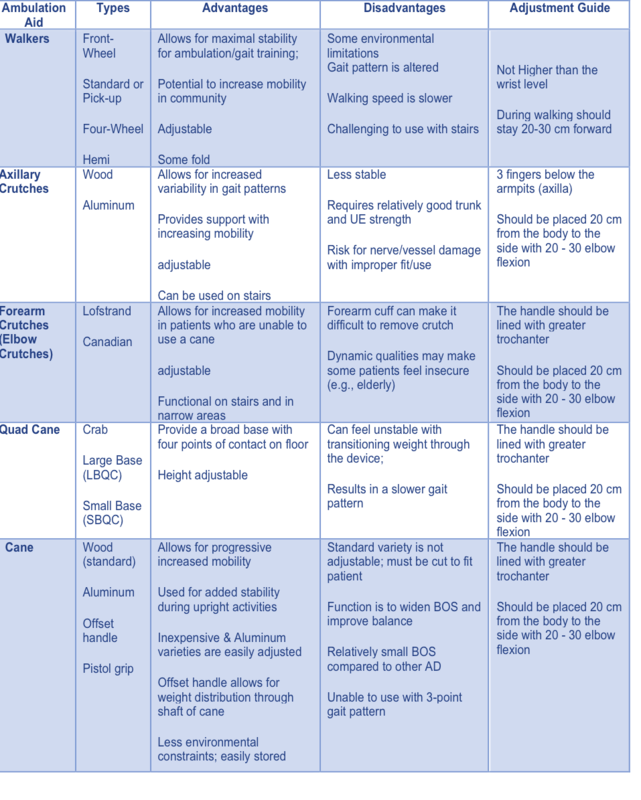 The prescription of an appropriate assistive device or walking aid will involve a multidisciplinary team evaluating many different factors and also should involve the patient in this decision. The WHO defined the manual wheel chair as: “Wheel Chair propelled by the user or pushed by another person, and it is appropriate when it meet the user needs and environmental condition”. According to WHO statistics 2008 ; 10% of 650 million Persons with disabilities (PwDs) are in need of a Wheel Chair, which reflects the huge need for a wheel chair and the resources needed to provide them. To avoid immobility and being bed ridden. To involve their users in community activities. To increase the opportunity for education, employment, and social interaction. 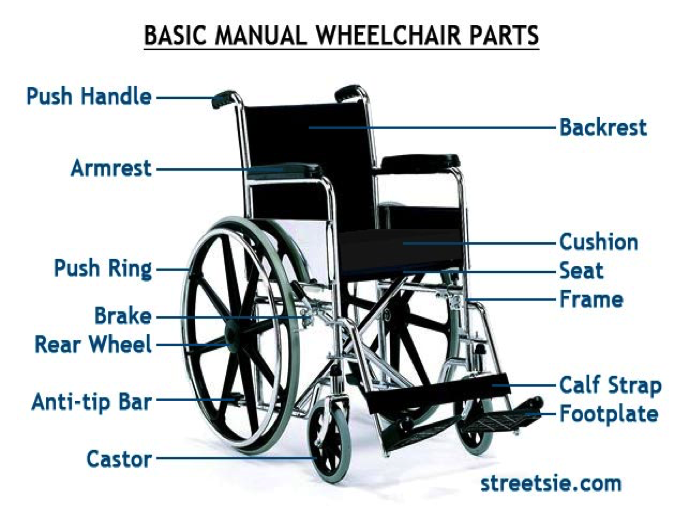 The picture below shows the main components of a wheel chair. According to the International Labor Organization(ILO) individuals with disability have a low employment rate with 80 % or more unemployed in low resourced countries which makes their living conditions worse. The majority of these individuals with disability are living in developing countries, so the infrastructure and living environment also present physical barriers to access. They also lack related rehabilitation Services, which reduces the level of awareness and education in the community, as well as limits the ability to meet the users needs in wheel chair design. There is huge variation in the type of the wheel chairs, and no single wheel chair will suit all users when considering their physical and environmental needs. The appropriate wheel chair for a user is the wheel chair which can to provide good safety and comfort, that fulfills the user’s physical and environmental needs to become mobile, healthy, and participate in the community. Foldable wheel chairs are used for the transportiation. A wheel chair can have extra support padding or cushions to address postural needs. A wheel chair that will be used indoors will be different from the one used outdoors. A wheel chair's functional performance is how well it fulfils it's user's needs in their particular environment . So it is the performance of the wheel chair for a specific user in their specific environment. The evaluation of wheel chair design for functional performance includes the evaluation of its static and dynamic stability, its rolling capacity and resistance, the access to repairs and spare parts, and its overall dimensions, mass and required turning space. For example when a wheel chair user has a bilateral above knee amputation his Centre of Gravity will be further back. So a wheel chair for this user needs to have its rear wheel positioned farther back behind the center of gravity for the user in order to have a good functional performance for this user. As an early stage for the rehabilitation of amputee patients postoperatively and especially with bilateral amputees, they will need to depend on the wheel chair, therefore they will might use it for long period during the day which might put them at risk of developing pressure sores if they don't follow instructions and complete appropriate exercises. Leaning from side to side. Very Important: Don’t forget to instruct the patient to lock the brake while exercising. When it’s difficult to avoid manual handling it’s possible to reduce the related complications and risk by adapting the working environment or systems used for the benefit of the patient and care giver. This handling equipment will vary in usage from one person to another due to their disability, age, severity of the case and socioeconomic status. Example equipment includes: transferring board, wheel chair, transferring sheet, stretcher, shower and bath equipment, standing hoist, transfer belt and other equipment. The surrounding environment, ergonomic and workplace design should meet the needs of both the individual with disability and the carers. The patient’s situation and degree of disability determine the kind of equipment involved in the handling process. Qualified staff and trainees assisting in the process of shifting and transferring. Staff must follow best practice guidance for safe manual handling. 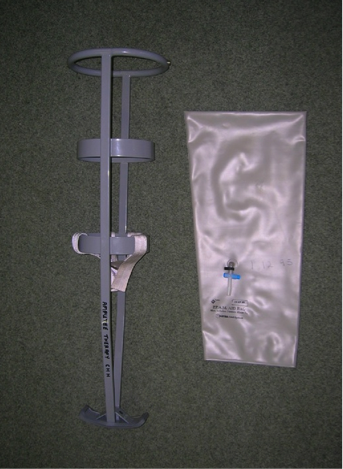 The early walking aid (EWA) is a temporary socket made up from an inflatable bag, supported by metallic frame with padded safely rings with a prosthetic or rocker foot . The EWA has been used to help in patient assessment and to start the treatment. One of the most important objectives of the EWA is to help the patient ambulate in an upright posture as early as their wound condition alows which will help patient psychological status. Also the EWA can accelerate the rehabilitation process through starting gait training and facilitating prosthesis fitting. The use of a EWA helps to improve balance, posture and sensory integration. The pressure provided by the air bag also helps to control the oedema, and decreases pain. Vacuum Technique as LIC Tulip. Preformed Plastic Socket as LIC Femorett, LIC LEMA, and Hexilite temporary patellar tendon Weight bearing. According to (Enstgrom and Van de Ven 1999) ; training with a Pneumatic EWA can start 7 to 10 days postoperatively, with gradual increasing of the pressure taking into consideration the wound condition. Usually starting the air inflation with 15 to 25 mmHg. Gradual increase of the pressure to a limit of 40 mmHg. Adapt the pressure according to the patients’ attitude to amputation, stability, recovery, and comfort. Continue inspection and observation of the wound as needed. Weight bearing should be restricted according to the physician's order. 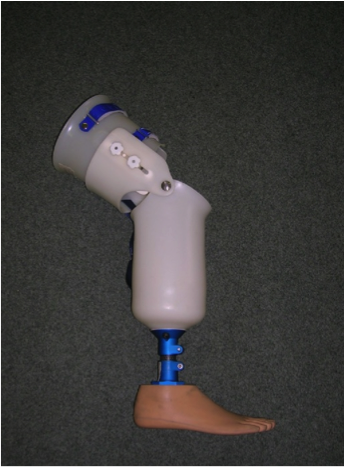 Please see the prosthetics page. A patient with an amputation can use a walking aid, either temporary or permanent to restore the functional ambulation and independency. The choice of aid is dependent on the level of fitness, strength, balance skills, and risk of falls. In addition the walking aid will help to control the allowed weight bearing on the injured leg, compensate the lack of balance, and decrease the risk of fall. Some patients can’t achieve this goal due to their age or another medical problem. Ambulation using a walker is not a required step to shift the patient from the parallel bar to crutches or cane, if their physical and medical condition allows. Usually when using a single walking aid it should be handled on their sound side, however it can be used on the amputation side if the goal is to shift more weight to this side. The drill to ascend and descend the stair is to ascend with the sound leg, and descend with the amputee side (Up good and down bad). A proper selection of a walking aid with proper adjustment will speed up the rehabilitation process and improve the quality of the outcomes. ↑ 6.0 6.1 (9)	Limb Amputation: From Etiology to Rehabilitation, the Postoperative Phase, Early Walking Aids, By R. Ham and L. T. Cotton, 1991, UK. ↑ 7.0 7.1 (10)	Tidy's Physiotherapy 13th Edition, Physiotherapy for Amputees, The Pre-prosthetic Stage, Edited by Stuart B. Porter, 2003, UK. ↑ Walking Aids, Special considerations about walking aids, ICRC, PDF Walking aids.